After making an appearance at E3 2014, Alienware’s Alpha small from factor gaming PC is now up for pre-order at $550 with shipments due in November. 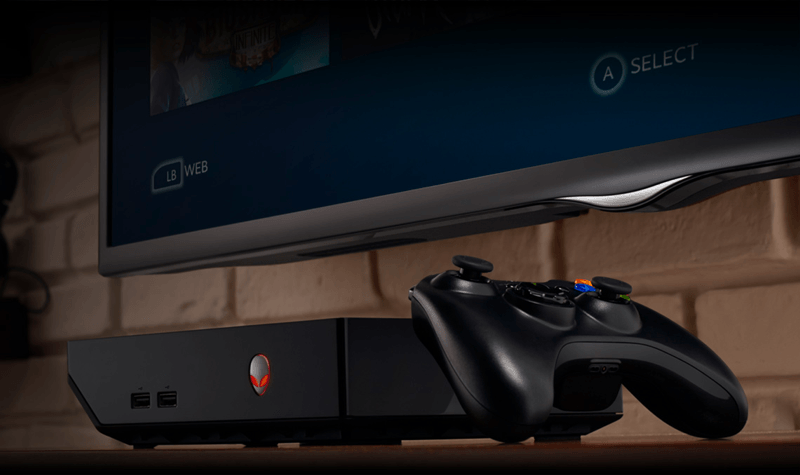 The device was originally announced as part of the initial Steam Machines lineup, but after Valve postponed the initiative to further polish its software and controller, Alienware forged ahead with its own solution. Instead of Steam OS, the Alpha runs Windows 8.1 with a custom user interface designed to deliver a very console-like experience -- but you can still switch to desktop mode. Alienware is also bundling one Xbox 360 wireless gamepad and dongle with each Alpha to make up for the delayed Steam Controller. The company didn’t just tack on a new interface and called it a day. While at the end of the day Windows is running things in the background, you don’t even have to see it unless you want to. Everything you typically do when setting up a new computer can be done through its couch-friendly UI, and Windows services that aren’t necessary for gaming are automatically deactivated when in Console Mode so your gaming sessions are never disrupted. The Alpha keeps Windows and graphics drivers updated automatically, though you can adjust those settings, and you can also plug in a mouse and keyboard at any time and run the Alpha as a standard Windows 8.1 desktop. As for downloading and actually playing games, the Alpha still relies on Steam Big Picture Mode -- a shortcut to Valve’s gaming platform sits front and center. And since you’re running Windows, you can always switch to Desktop Mode and run any game outside of Steam or stream a movie off Netflix. In terms of hardware the base configuration includes an Intel Core i3 processor, 4GB of RAM, 500GB of storage, and a custom Nvidia-based graphics card with 2GB of dedicated memory. You’re not getting anything that will rival en enthusiast-grade gaming machine -- it’s more about making PC gaming accessible in a frustration-free package for anyone. At $550 with an HDMI cable, Xbox 360 wireless controller and dongle, plus 2 free games it’s not a bad deal either. Alienware says the Alpha can run games like Dark Souls II and both Metro Redux and Dying Light smoothly with high quality settings and anti-aliasing at 1080p.